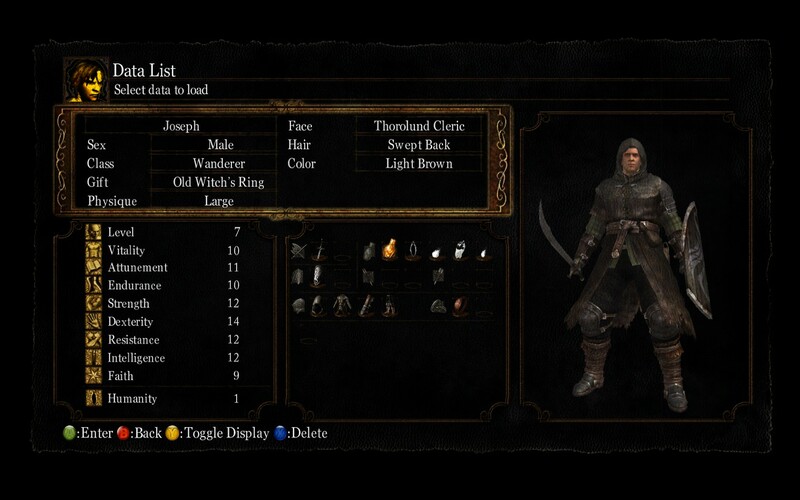 Dark Souls Journal #01 – What Have I Done? *Blind playthough means I’m not consulting any external guides or tutorials for hints or tips about how to play the game. All I have is the game and its manual. Why did I sign up for this? No, really: What did I get into? Or the more accurate question would be: Who got me into this? I blame Zachery and Brandon from the Facebook group I’m a part of, Theology Gaming University. “Try it”, they said. “You’ll love it”, they said. Of course I’d heard of Dark Souls before, I just never had a reason to care. Anyone who has been around gaming even a little but over the past few years has heard of Dark Souls. It’s a game made by a Japanese developer and released to consoles in 2011, and later made its way to the PC in 2012. So what exactly is it? Over the years I’d seen a lot of coverage of the game but never really paid it any mind because it just didn’t seem like it was my thing. Big guys in armor swinging swords. Torches and castles. No lasers or spaceships. No humor. Supposedly punishing difficulty. Story and background history told in an overt manner. The impression I got is that it was difficult hack ‘n’ slash game made to punish anyone brave enough to give it a try. Turns out I may not have been too far off the mark on that assessment. I got the game for $5 during a recent sale at the Humble Store, donating my 5% Humble Tip to the Wounded Warrior Project. 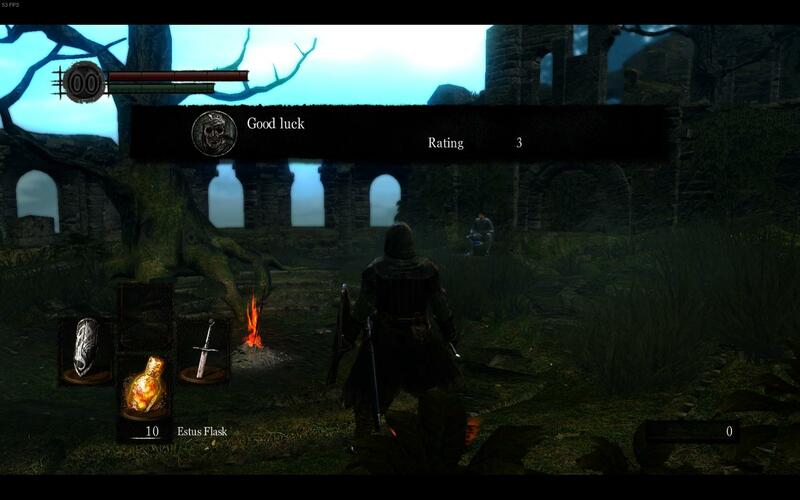 After doing a bit of research I found an excellent guide to configuring the game at the Dark Souls subReddit. While you don’t have to do everything recommended there, DSfix is an absolute must to get the game running properly. I also went for an HD texture pack and font upgrades. The first time I started the game I got some weird graphical glitches where the HUD was fullscreen, but the gameplay was only showing in the top left corner of the screen. Turns out that was a result of me not fully reading the instructions for DSfix. I didn’t disable Anti-Aliasing from the in-game menu like I was supposed to. Who knew it would make that much difference? Starting a new game brings you to a character creation screen where you can choose your class, talents, gifts, and a few other attributes. Not having any idea what differences any of these would really make I went with the Wanderer. If I’m given the option I usually try to pick something that might approximately apply to me, and I certainly don’t have the traits of a soldier or a magician. Picking a “Large” physique character who walks around a lot and carries a cool-looking curved sword seemed to make the most sense to me. There is an impressive opening cinematic that lays out some interesting-looking history from the world of Dark Souls, but as far as I could tell there wasn’t any context for how my character fit into the grand scheme of things. When I took control of the game my character was locked in a cell, and someone tossed me a key to allow my escape. The only tool afforded me to help in my escape was the hilt of a sword. Not the sword’s blade, or a knife, or anything sharp, but a handle. Why do I get the impression this is a sign of things to come? For some reason I’m a prisoner in the Northern Undead Asylum and I look decidedly less than human. Am I dead? How did I get to the asylum? Why am I escaping? I didn’t grab any screenshots of this opening level because I was too busy mashing buttons on my controller and trying to stay alive. Things didn’t seem to difficult at first; I think I only died once in the tutorial level. After beating the tutorial’s boss a giant raven grabbed me and flew me to what I assume is the main game’s world. Hints and other messages are littered throughout the game in the form of glowing scratch marks. The raven dropped me in Firelink Shrine, an interesting-looking little place. There are ruins strewn about. There’s a guy loitering near the fire who tells me about two bells; one in a high place and the other someplace down below. The implication is that I’m supposed to go to one of or both of those places and ring some bells. So there’s death, darkness, undead, demons, and now bells are involved. Great. I hate bells. You’ll see this screen an awful lot. There may be multiple paths of progression from here, but nothing really stands out. The most obvious one to me involves some stairs that make a winding descent, eventually leading to an elevator that goes down even further. Eventually I wind up at a place called New Londo Ruins. Visually, it’s a pretty place as far as ruins go. Crumbled structres loom in front of a dark blue haze, backlight by a far-off light source. There are some apparently distracted and quite weak zombie dudes, and so far the ruins don’t seem too bad or too hard to go through. After slicing and dicing my way through a dozen or so brain-dead undead I notice that each enemy I kill makes a counter in the bottom-right of the screen go up. Each enemy has a value or something. Come to find out that somehow I’m collecting “souls” from my slain enemies and this is some kind of in-game currency. 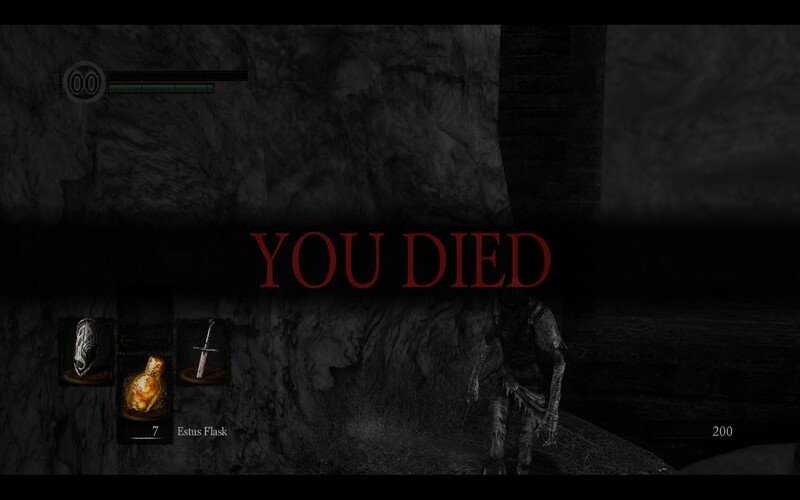 Morbid, but I guess that’s why the game is called Dark Souls, and not Happy Fun Souls. Eventually I make my way to the edge of a giant subterranean pond with wood walkways sprawling out before me. Just before the first walkway is one of those helpful glowing hints that says something like: “Bravery: 1 Required”. I check my stats to see if I have any bravery. …no, it doesn’t look like it. Well, let’s go forward anyway; I’m sure it’s just a suggestion! A few steps down the path I encounter two ghosts. How hard can this be? Whoa! They can reach out like the creepy ghost that stole the baby in Ghostbusters 2! I wonder if I can try to mo-YOU DIED. Well crud. Brutally throttled in the back by an undead vapor. I don’t think I even landed one hit on those guys. I respawn at the bonfire at the top of Firelink Shrine and do the same thing again. Once I hit the ground floor it quite literally hits me: enemies don’t stay dead. Every time I respawn, either from death or resuming a saved game, every enemy respawns back in the game world no matter how many times you’ve already mowed through them. That’s just rough. Searching through my inventory I find a curse or something that says it allows me to engage in fights against ghosts, and I just so happened to be carrying two of them. Armed with this new knowledge I rush back to the depths only to find out they don’t help, I still died. Twice. Though those last two times I didn’t die quite so quickly. That’s progress, right? I think the game is trying to tell me that progressing through the New Londo Ruins is not what I’m supposed to be doing. Surely there must be some other avenue to take? We’ll find out. 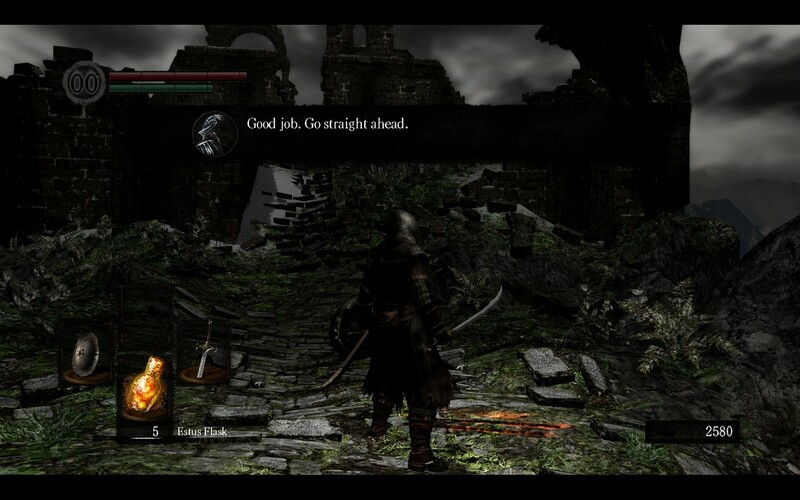 Those glowing orange marks contain helpful game wisdom and encouragement. It gives me the warm fuzzies inside.